Back in the day, one could walk down Colborne Street and see carcasses hanging in the windows of the local butchery, a sight very rarely seen today. In the 1850s, a butchery was opened by Edward Hillmer, after a long sequence of events. After a partnership went awry, when Hillmer’s partner disappeared with all of their assets, Hillmer was left with only a single English penny at the time. After sympathizing with Edward Hillmer, a farmer was kind enough to give him a calf on credit which he later butchered and sold in town. After returning to repay what he owed, the farmer was so impressed he gave Hillmer two sheep for the same deal. 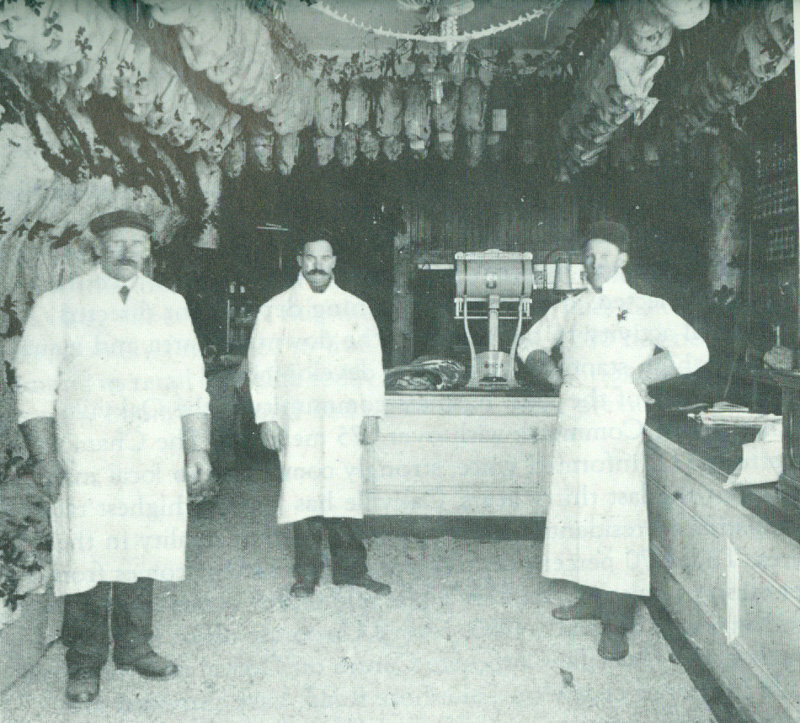 Proving to be very profitable, another fellow lent Hillmer the goods he needed to get started, and so began Hillmer’s Meat Market. Another meat market was founded in 1903 by William A. Buckle. Three years after the Queen’s Hotel closed, William Buckle remodeled the building and opened up a butchery. In the shop, a variety of meat hung from hooks including beef and turkey. As Frances R. Ahern recalls, “To enter this shop was to step onto a thick carpet of clean sawdust, marked by the occasional pool of blood”. 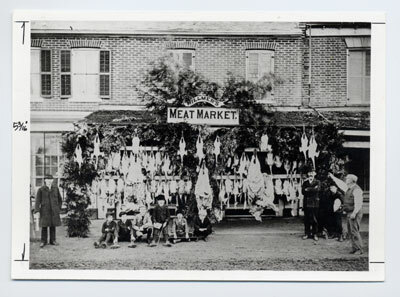 This meat market was housed in a two-storey building with living quarters residing on the second floor. Information credited to: Ahern, Frances Robin. Oakville: A Small Town (1900-1930). Erin, Ont. : Oakville Historical Society in association with The Boston Mills Press, 1981. Print. and to: Mathews, Hazel C. Oakville and the Sixteen. Toronto, Ont. : University of Toronto Press Incorporated, 1953. Print. and to: McKeon, Clare and Joseph P. McKeon. Oakville, A place of some importance. Burlington, Ont. : Windsor Publications, 1986. Print.